I shared this picture on Facebook last night. Joe had to leave early yesterday morning for two weeks. He left before Skyler woke up, so all day I had to explain that daddy was at work when he asked about him (a lot). 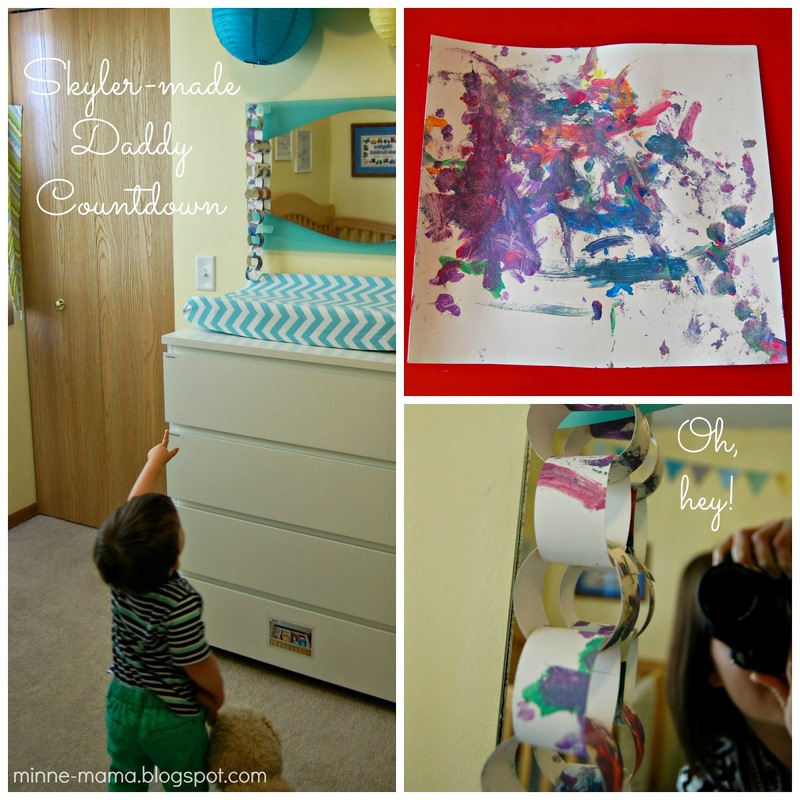 During his nap I wanted to make a countdown like the one for his training in February. 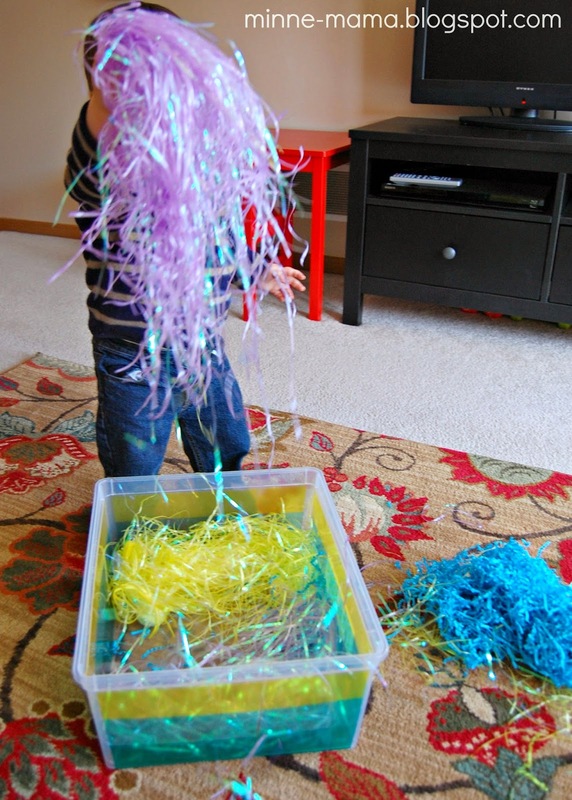 I was going to go out and buy some pastel paper for an Easter themed chain, but I remembered this cute glittery painting Skyler made last week (with paint we had leftover from a craft). I put it up when I got him up from his nap and he was immediately interested in "my painting!!" I picked him up and we counted the paper links, talked about daddy being at work for those days, and we cut off the first day! I am just happy that this trip is just two weeks and not the whole month - it doesn't seem quite as hard after that! 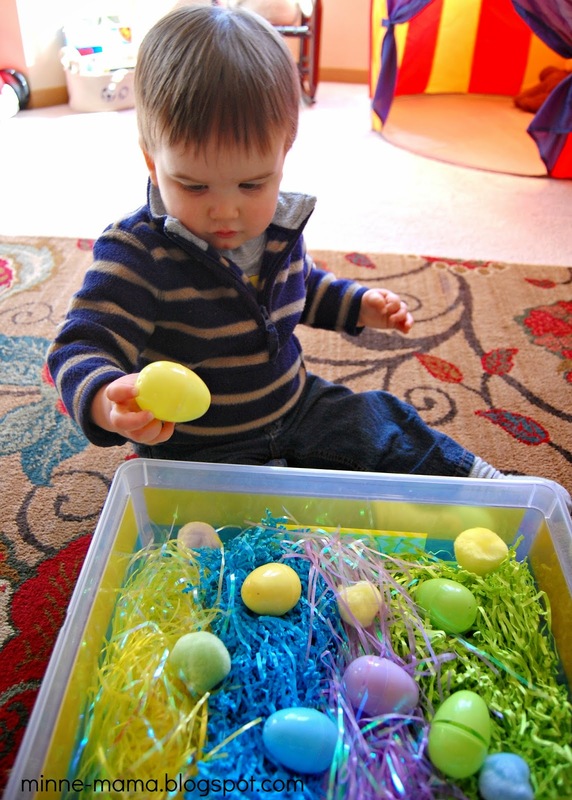 Skyler is still very interested in his vehicle sensory bin. 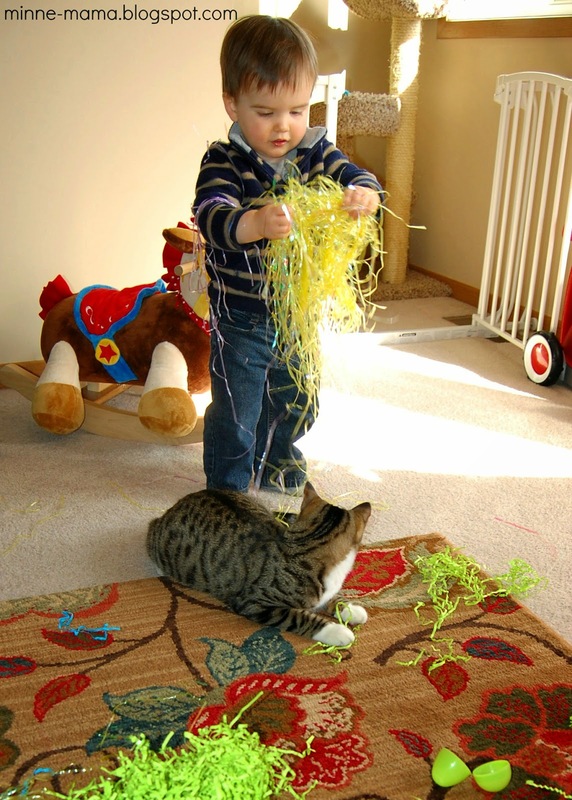 We play with it almost daily! 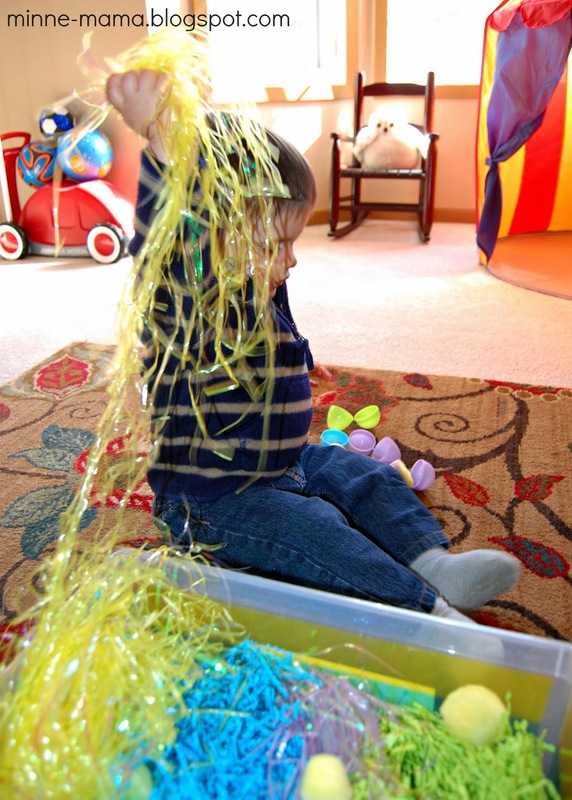 He really enjoyed his St. Patrick's Day bin around the holiday, but with Easter coming up quickly, it was easy to say goodbye to our green bin for this pretty pastel one! 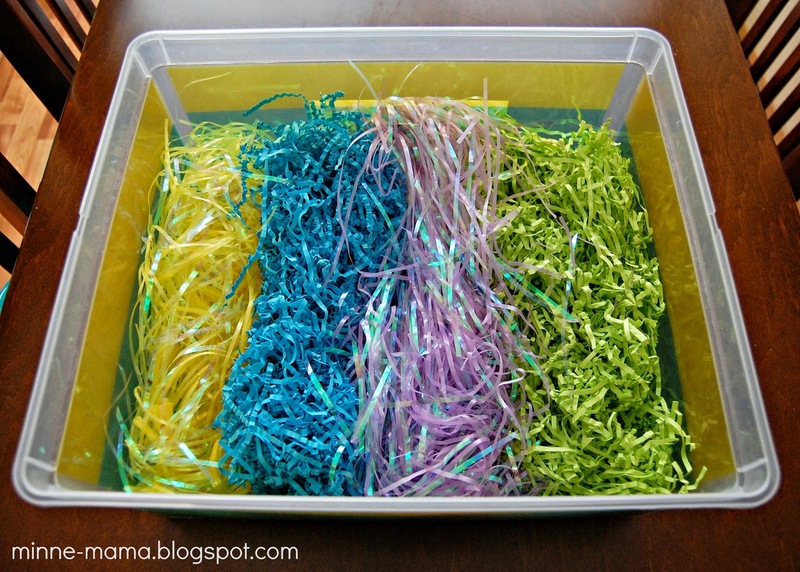 For the base of the bin, I was going to use either the shiny plastic Easter grass or the crinkly paper grass, but at the last minute I put a mixture of both! 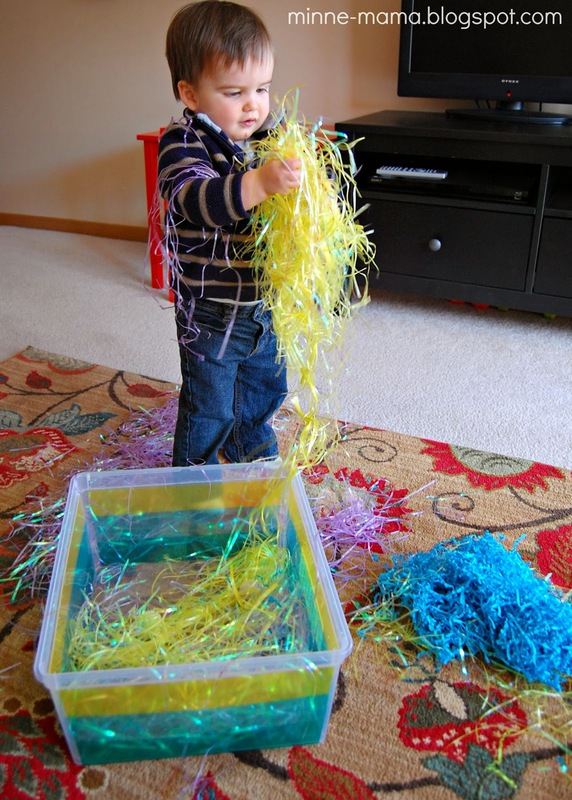 I thought the difference in materials would be fun to compare when we felt them, and it gave a little more color to the bin. 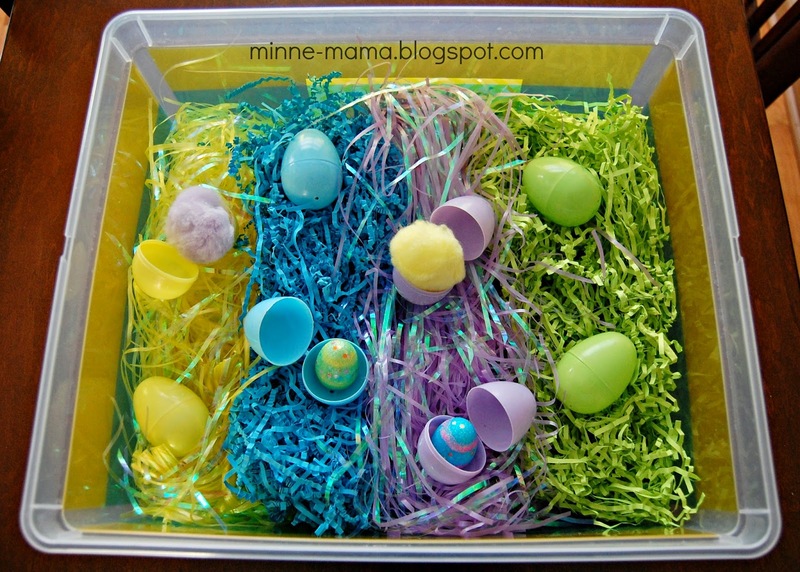 I found these pretty sparkly foam eggs and knew I wanted to include them in our sensory bin. 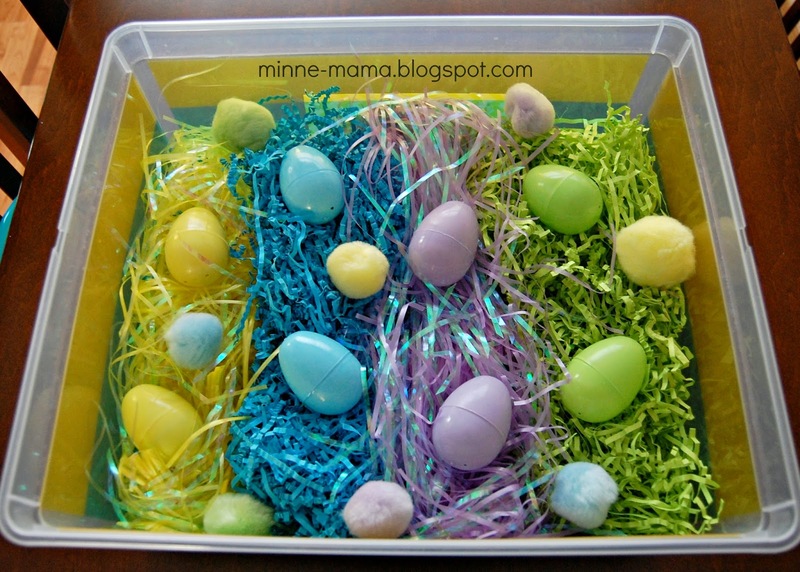 I loved this sensory bin from Fun at Home with Kids, so thought it would be fun to use the foam eggs as the "shakers" along with some pom-poms. 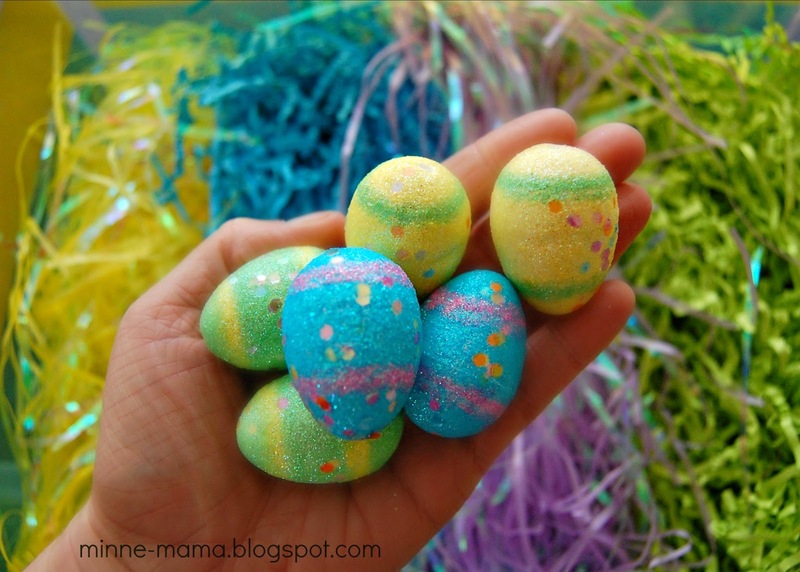 I put these sparkly eggs into six of the plastic eggs (and they make a great loud noise!) 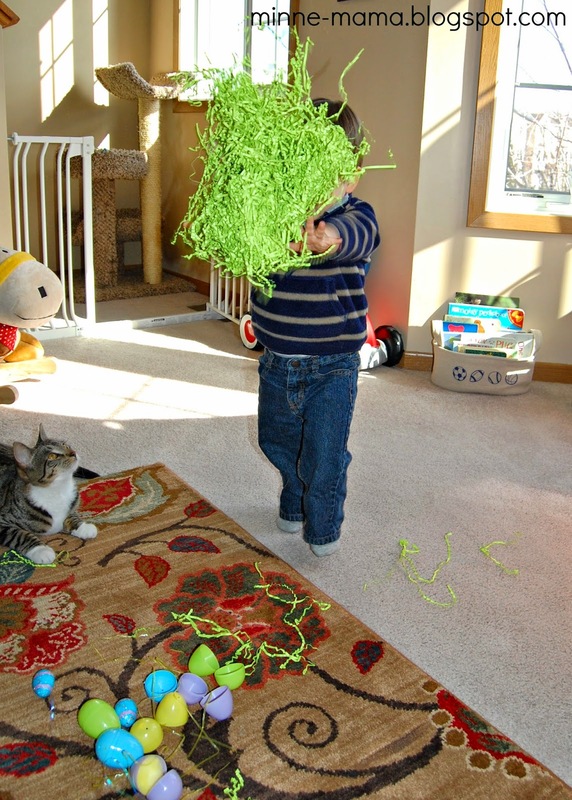 and pom-poms in the other two, with some extra pom-poms thrown in. 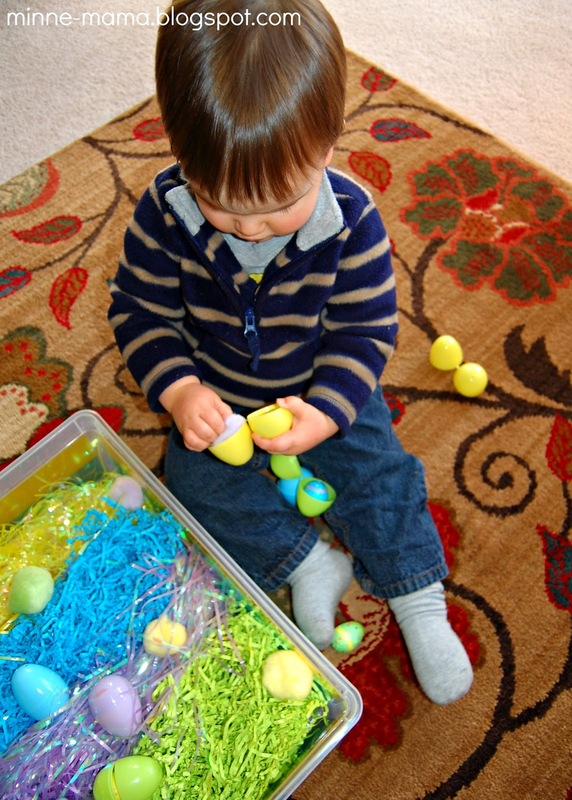 Skyler went through the bin, one by one picking out the plastic eggs, shaking them and opening them up. 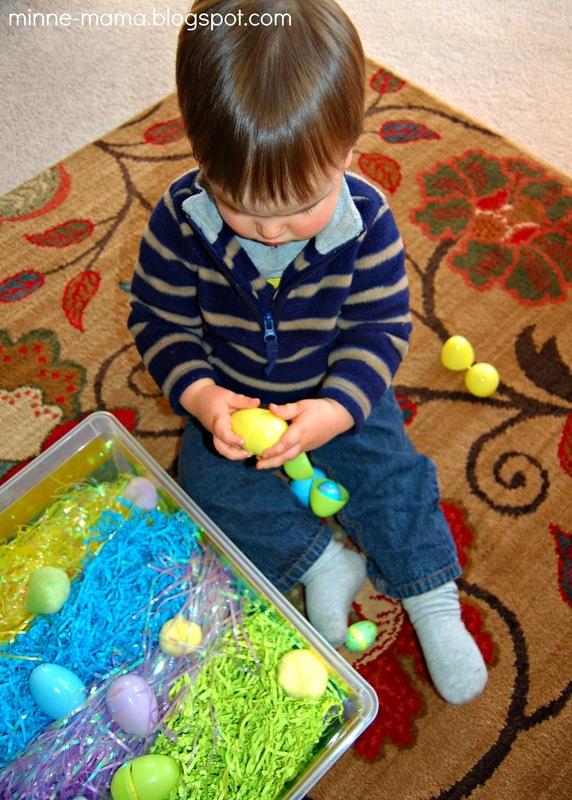 It was so methodical how he picked out the eggs to check what noise they made and what was inside them. 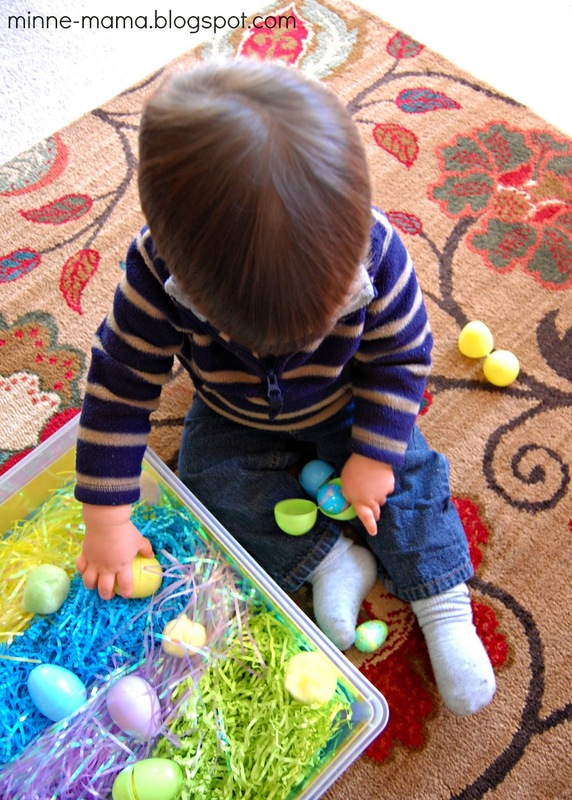 I loved listening to him talk about the eggs as he went. 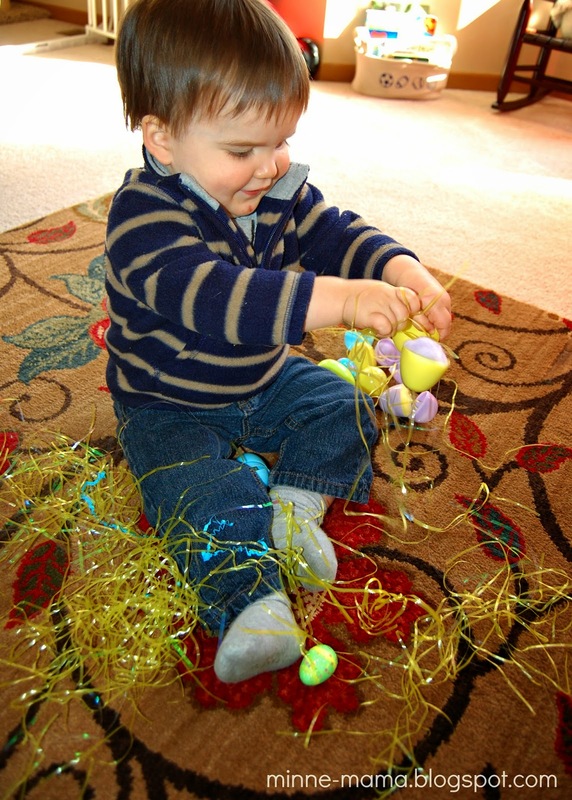 He named all the colors he held and I described the foam and pom-pom fillers as he opened the eggs up. After he had picked out and opened up all eight eggs, he immediately pulled out the different colors of Easter grass (also one by one, so funny!) 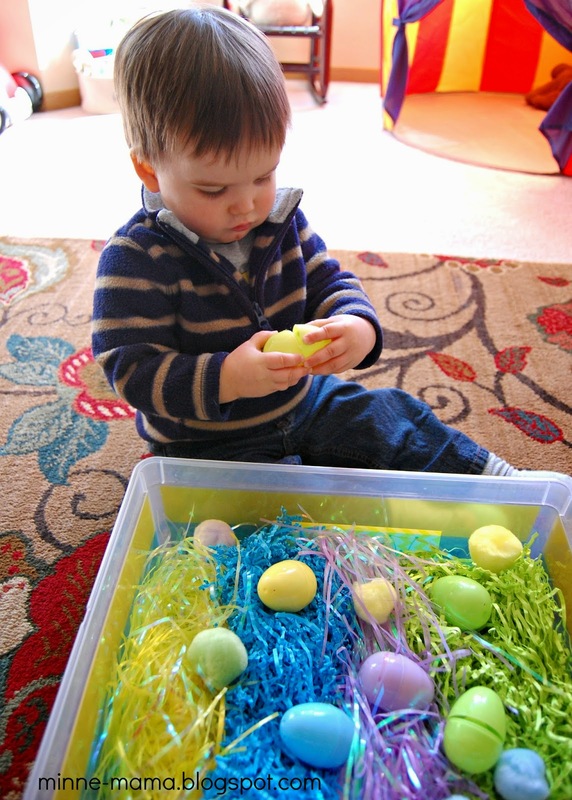 At first Skyler tried to fill up his eggs with the grass. 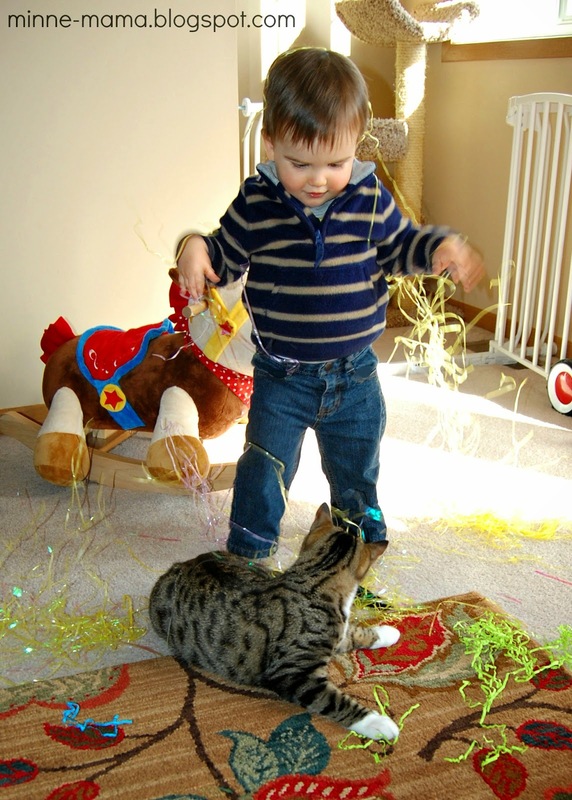 After Skyler spent some time "walkin' on grass!!" 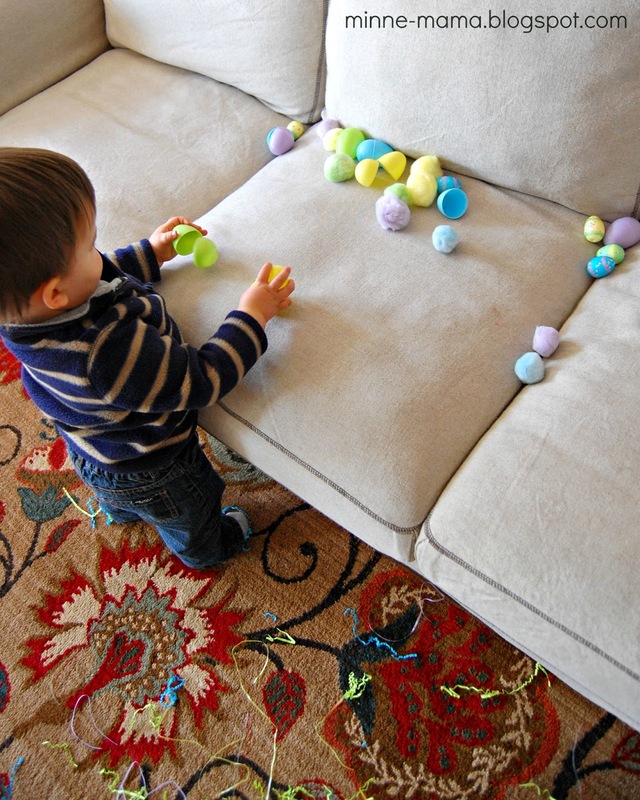 he picked up every plastic egg, foam egg, and pom-pom and put them on the couch where he stood and filled eggs for a long time. The grass wasn't super fun to clean up, but I put in on the carpet because I thought it would be better that trying to sweep up every piece on the wood floor. 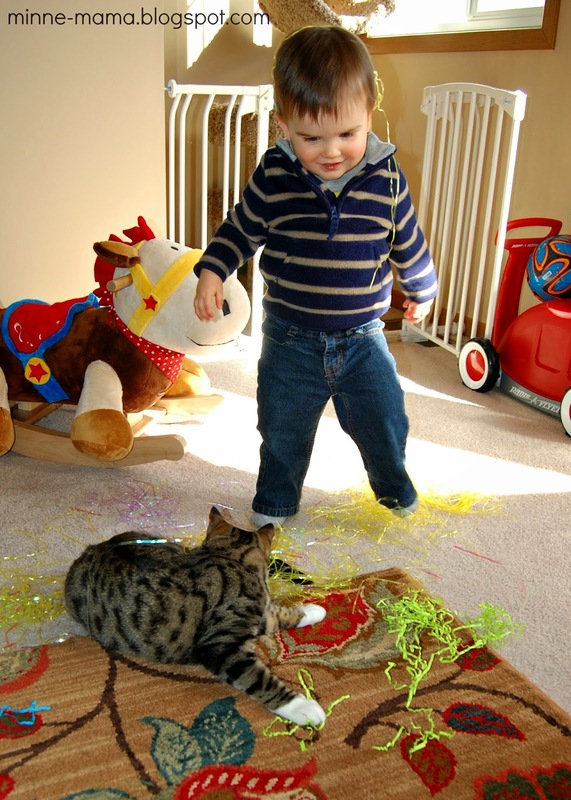 It was easy to see the grass on the rug and when we made a claw with our fingers we could "sweep" it up that way. To put the bin away after playing, we just put in all of the combined grass which still looks so pretty! 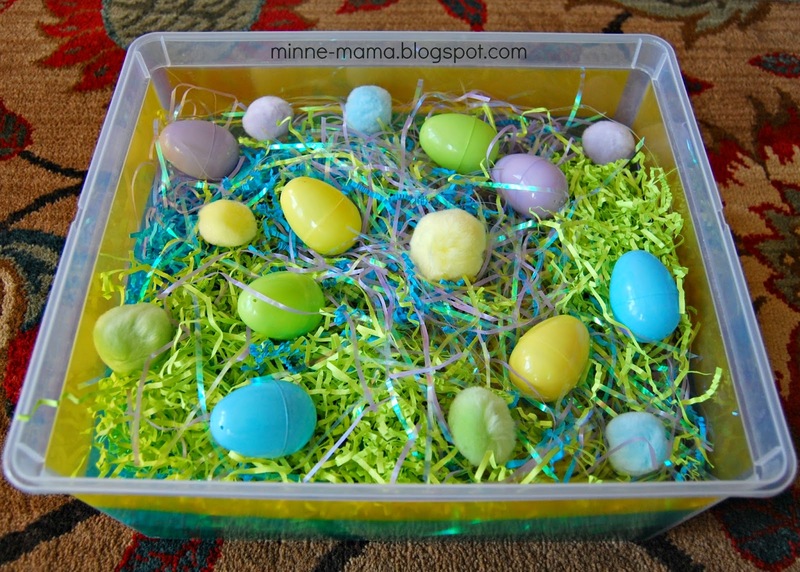 Then, just like it was before added in the eggs and pom-poms. 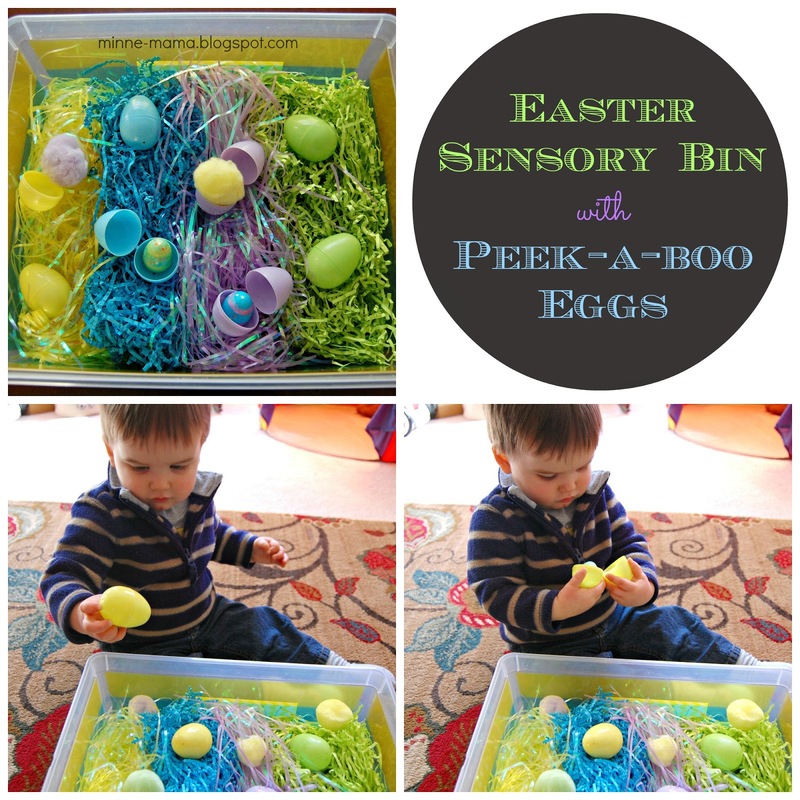 This Easter themed sensory bin is a lot of fun to play with. 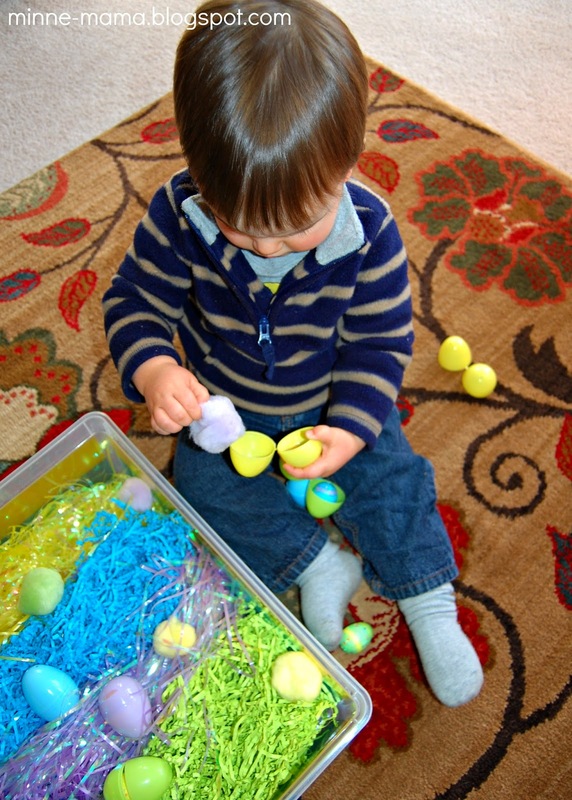 Skyler has gotten so good opening and closing the eggs and there are so many colors, textures, and sounds to talk about while playing!